Don’t you just hate when, on the day you’re supposed to retire, aliens invade completely derailing your plans? Okay so there are a lot of plot points that are cliché, but Battle: Los Angeles does look like it’s going to be a great action movie, packed full of explosions. The story is a simple one that we’ve seen many times before. The military fight to protect the world from evil invading aliens, who, for some reason, are (or at least use) robots. The characters are given the standard back stories; one was a sergeant in Afghanistan who is grieving the loss of his soldiers, another’s about to become a father, then there’s the one whose brother served, and died, under the aforementioned sergeant. So it’s not the most original movie out there, in fact from first glance I thought I was watching a trailer for Transformers 3. Interestingly, I was all set to write a bad review about it until I seen the longer trailer (below). If you like action, then this is definitely a film you should be interested in and it comes out tomorrow, the 11th of March, so you don’t even have long to wait. Also, the movie is 2D, thankfully. This is because the director felt that combining 3D with handheld cameras would make people throw up. The inspiration for the movie came from a falsely suspected air raid of Los Angeles that took place during the Second World War and from YouTube videos of Marines fighting in Fallujah. The intention was to make the movie a realistic depiction of an alien invasion and the war that would ensue. The film stars Aaron Eckhart, Michelle Rodriguez, Lucas Till, Ne-Yo and Ramon Rodriguez. It was directed by, South African director, Jonathan Liebesman. 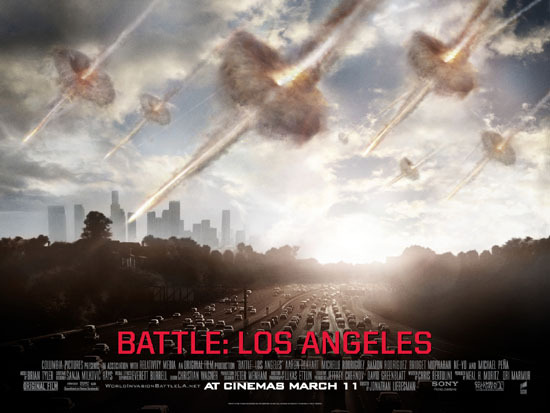 If you’re still undecided about whether or not to see Battle: Los Angeles watch the trailer below, but don’t get too upset if it doesn’t look like Los Angeles because it was shot in Louisiana.